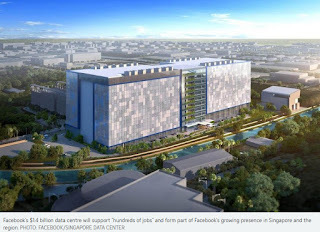 Hundreds of jobs will be generated from the opening of social media giant Facebook's $1.4 billion data centre in Singapore - its first in Asia and its 15th in the world. Jobs will include technical operations, electricians, air conditioning, and heating specialists, culinary, cleaning staff, logistics staff and security. The centre - to be at Tanjong Kling, formerly known as Data Center Park - aims to start operations in 2022. Groundbreaking took place yesterday. Facebook said yesterday: "Our data centres are highly-advanced facilities that help bring Facebook apps and services to people around the world every day." The 170,000 sq m, 11-storey building will feature a facade made out of a perforated lightweight material that will allow air flow and provide glimpses of the equipment inside. Mr Thomas Furlong, Facebook's vice-president of infrastructure data centres, said Singapore was chosen for its robust infrastructure, access to fibre, a talented local workforce, and support from government agencies, including JTC and the Economic Development Board. Announcing the centre in Singapore yesterday, he noted that Facebook has around 1,000 employees in Singapore, and boasts programmes that promote media literacy to help local start-ups expand. Trade and Industry Minister Chan Chun Sing said Facebook's presence here is important in helping Singapore connect to the rest of the world by transcending the "physical constraints of size and space", and making the country a part of the global data centre value chain. The project is also a milestone in that it "helps break new ground in land utilisation and energy consumption", he added. The centre is said to be the first to incorporate the new StatePoint Liquid Cooling system, which minimises water and power consumption. It aims to reduce by 20 per cent the amount of peak water used in climates like Singapore's. Facebook said the facility is expected to be powered by 100 per cent renewable power. US Internet giant Google announced last month that it is building a third data centre in Singapore to meet rapid user growth in the region. The setting up of new data centres here, such as Facebook's $1.4 billion operation in Tanjong Kling, could strengthen Singapore's "local IT core", creating roles such as network engineers and cyber security specialists to support the centres' daily operations, said human resource experts. Last Thursday, Facebook said its new data centre here - its first in Asia and 15th in the world - will support hundreds of jobs and form part of its growing presence here and in the region. The centre is expected to start operations in 2022. The move follows the likes of tech giant Google, which employs about 1,000 people in Singapore and is building a third data centre here in Jurong West which is expected to come online in 2020. It started building its first South-east Asia data centre here in 2011. A Facebook spokesman said its data centre projects generally involve hundreds of millions of dollars in investment over the long term, supporting "thousands of construction jobs and hundreds of operational jobs". Mr David Leong, managing director of PeopleWorldwide Consulting, said demand for data centre employees has increased, with engineers and technicians "hard to come by". He said foreigners are needed to boost the sector's growth and they could initially account for up to 40 per cent of total hires. ManpowerGroup Singapore's country manager Linda Teo said locals may eventually run the show. "As it is more cost-effective for a local team to handle the data centre's operations, employees sent over by the organisation to set up the data centre will also be tasked with creating and building a local team that may eventually take over the operations," she added. A study by real estate services firm Cushman & Wakefield found last year that Singapore is the most robust market out of 10 Asian hubs, including South Korea and Japan, in terms of business operations for data centres. This is due to Singapore's network infrastructure and connectivity to major Asia-Pacific markets. A report by Structure Research also predicted the data centre industry's market value here would be lifted to about $1.6 billion by 2020. There are 50 or so data centre operators here, of which six - such as real estate investment trust Digital Realty - capture 70 per cent of the market share, said Cushman & Wakefield associate director Lynus Pook. International players here include Equinix and Global Switch. Local players include Keppel DC Reit as well as ST Telemedia. "Data centre capacities are set to grow by at least 10 to 15 per cent annually, among the key players," he added. In turn, the sustainability of Singapore's data centre market depends on factors such as its 5G network infrastructure and ability to keep costs competitive globally, he said. With the full realisation of data-intensive, emerging technology such as the Internet of Things and artificial intelligence, Mr Bruno Lopez, group chief executive of ST Telemedia Global Data Centres, expects industry growth to surge in the medium term, with "a rise in newer, hyperscale data centres in the country".